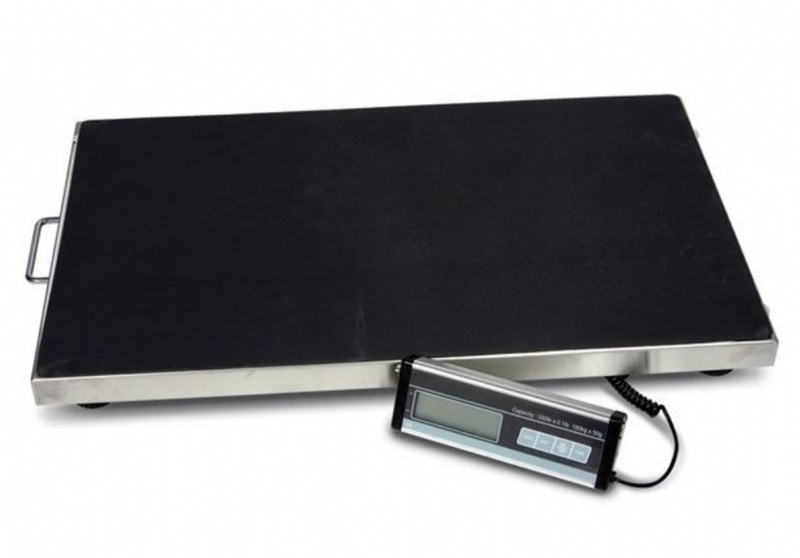 A robust solid scale with rigid stainless steel platform and removable rubber mat. These scales have a handle and two wheels are fitted to aid movement. The remote indicator has a dual purpose wall or desk mounting bracket. Power is from an on board rechargeable battery pack , but you can run it direct from the mains with the dual pupose charger/mains power supply unit supplied with the scale. Capacity 150kg x 50g , with lbs as well. 300kg x 100g also available. Auto hold of correct weight. Rechargeable power with AC adaptor/charger supplied as standard. Top quality stainless steel plate with detachable rubber mat for easy cleaning. Large platform 900mm x 550mm.